Fig. 1. The ivory triad from Mycenae. Athens, National Archaeological Museum, inv. no. 7711 (© National Archaeological Museum, Athens). Fig. 2. Fragments adapted to Pylos fresco figure (drawing by R. Ruppert; modified from Lang 1969, pl. 121B). Fig. 3. Gold signet ring from Tiryns. Athens, National Archaeological Museum, inv. no. 6208 (© National Archaeological Museum, Athens). Fig. 4. Fragments adapted to Tiryns signet ring figure displayed in figure 3 above (drawing by R. Ruppert). Fig. 5. Fragments adapted to Mycenae signet ring figure displayed in figure 3 in accompanying published article (drawing by R. Ruppert). Fig. 6. Fragments adapted to Chania sealing figure (drawing by R. Ruppert). Fig. 7. Ivory plaque from Mycenae. Athens, National Archaeological Museum, inv. no. 2641 (© National Archaeological Museum, Athens). Fig. 8. Fragments adapted to the ivory plaque figure from Mycenae displayed in figure 7 above (drawing by R. Ruppert). Fig. 9. Reconstruction of goddess with outline of Chania sealing figure (drawing by R. Ruppert). Fig. 10. Reconstruction of goddess with outline of the ivory plaque figure from Mycenae displayed in figure 7 above (drawing by R. Ruppert). Fig. 11. Reconstruction of goddess with outline of Pylos fresco figure (drawing by R. Ruppert). Fig. 12. Reconstruction of goddess with outline of Tiryns signet ring figure displayed in figure 3 above (drawing by R. Ruppert). Fig. 13. Linear B ideograms (drawing by R. Ruppert). Fig. 14. Experimental replication by the author of miniature figure's dress (heanos), front view. Fig. 15. Experimental replication by the author of miniature figure's dress (heanos), back view. Fig. 16. Experimental replication by the author of the kilt of the ivory triad from Mycenae (model: D. Oktay). Fig. 17. Detail of skirt, Fragments 10–14, 26; preliminary drawing and arrangement by the author (K. May; courtesy INSTAP-SCEC). Fig. 18. Detail of hem, Fragments 27–30, 32, 34–8; preliminary drawing and arrangement by the author (K. May; courtesy INSTAP-SCEC). Fig. 19. ragments adapted to outline of Striding Lady from Thera (drawing by R. Ruppert; modified from Doumas 1992, pl. 6). Fig. 20. 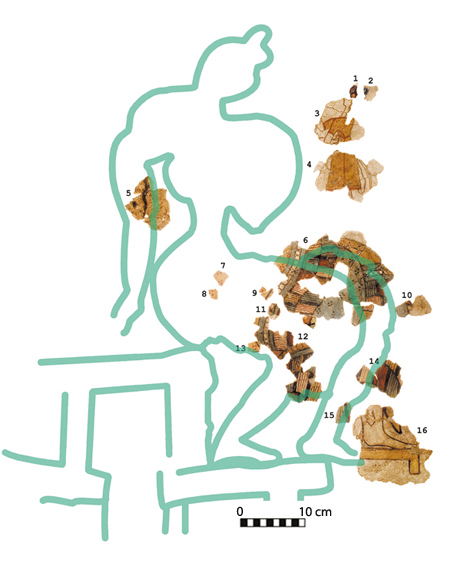 Fragments adapted to outline of figure from the Cult Center at Mycenae (drawing by R. Ruppert; modified from French 1981, fig. 12). Fig. 21. Reconstruction B of the Mykenaia with outline of the Striding Lady from Thera (drawing by R. Ruppert; modified from Doumas 1992, pl. 6). Fig. 22. Reconstruction C of the Mykenaia with outline of striding woman on Mycenae signet ring figure displayed in figure 3 of accompanying published article (drawing by R. Ruppert). Fig. 23. Reconstruction A of the Mykenaia with outline of figure from the Cult Center at Mycenae (drawing by R. Ruppert; modified from French 1981, fig. 12). Fig. 24a. Experimental replication by the author of the frontless blouse, front view, of the Hagia Triada bucket carrier displayed in figure 11 of accompanying published article. Fig. 24b. Experimental replication by the author of the frontless blouse, side view, of the Hagia Triada bucket carrier displayed in figure 11 of accompanying published article. Fig. 24c. Experimental replication by the author of the frontless blouse, back view, of the Hagia Triada bucket carrier displayed in figure 11 of accompanying published article. Fig. 25a. Experimental replication by the author of dress (heanos) of the Mykenaia, front view. Fig. 25b. Experimental replication by the author of dress (heanos) of the Mykenaia, side view. Fig. 25c. Experimental replication by the author of dress (heanos) of the Mykenaia, back view. Fig. 26. Reconstruction B of the Mykenaia (drawing by R. Ruppert). Fig. 27a. Experimental replication by the author of the blouse and dress (heanos) of the Mykenaia based on reconstruction B, front view. Fig. 27b. Experimental replication by the author of the blouse and dress (heanos) of the Mykenaia based on reconstruction B, side view. Fig. 27c. Experimental replication by the author of the blouse and dress (heanos) of the Mykenaia based on reconstruction B, back view. Fig. 28a. Experimental replication by the author of the blouse and dress (heanos) of Mykenaia, based on reconstruction C, three-quarter view. Fig. 28b. Experimental replication by the author of the blouse and dress (heanos) of Mykenaia, based on reconstruction C, side view. Fig. 28c. Experimental replication by the author of the blouse and dress (heanos) of Mykenaia, based on reconstruction C, back view. Doumas, C. 1992. The Wall Paintings of Thera. Athens: The Thera Foundation and P.M. Nomikos. French, E. 1981. “Cult Places at Mycenae.” In Sanctuaries and Cults in the Aegean Bronze Age. Proceedings of the First International Symposium at the Swedish Institute in Athens, 12–13 May, 1980, edited by R. Hägg and N. Marinatos, 41–8. SkrAth 4°, 28. Stockholm: Paul Åströms Förlag. Lang, M. 1969. The Palace of Nestor at Pylos in Western Messenia. Vol. 2, The Frescoes. Princeton: Princeton University Press.